I can’t remember exactly how I made this, so some of these numbers may be off. Combine the water, yeast, and sugar and let sit for a few minutes to foam, then mix with the flour, salt, and half the olive oil. Knead the dough until it is smooth and slightly sticky, then cover and allow to rise until doubled (about an hour). When the dough has risen, punch it down and knead briefly, mixing in 2 tsp of the rosemary, then stretch or roll it on a parchment-line baking sheet. Cover and let it rise for 30 minutes. 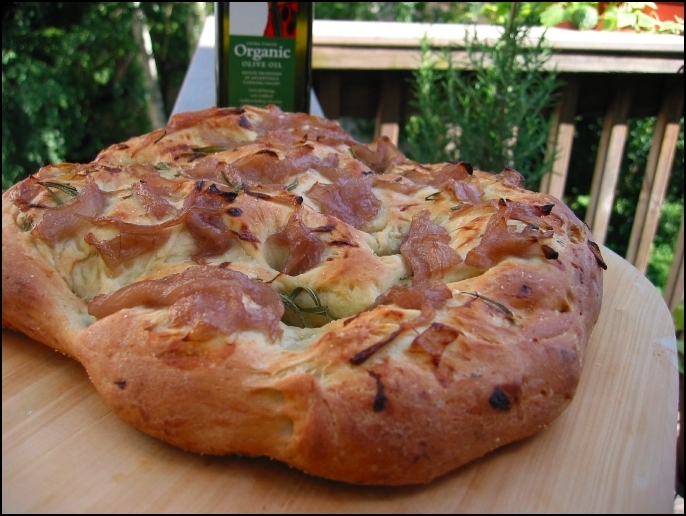 Using your finger, poke holes all over the dough, then sprinkle with remaining olive oil and rosemary, some coarse salt, and as much of the caramelized onions as you can fit. Bake in a 400° oven for 30-40 minutes until golden brown and as crispy as you like it. Cut onions into thick slices and sauté in a little olive oil over medium heat with pinch of salt. When the onions have softened, add a drizzle of maple syrup and continue to cook. Once everything is nicely browned, use some red wine to deglaze and you’re done. Yum! Wish I’d been there for that one. Not to worry, Deedle, there is plenty more bread in my future!